This stunning golf shield is designed and made by us. Manufactured from 6mm cherry wood veneered mdf and finished with a jade glass effect perspex. 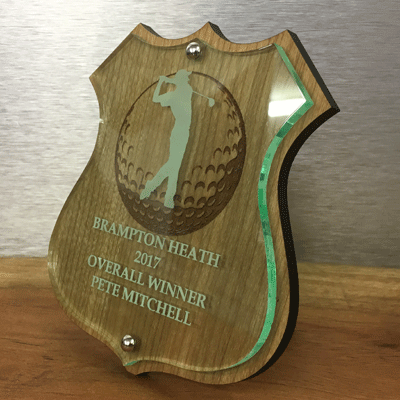 The wood shield has a golf ball engraved as standard and the perspex has a golfer engraved as standard. Personalised to your own requirements below the image of the golfer.